Tsunami strikes Ao Nang, Thailand. The 2004 Indian Ocean earthquake, known by the scientific community as the great Sumatra-Andaman earthquake, an undersea earthquake, occurred at 00:58:53 UTC (07:58:53 local time) December 26, 2004, with an epicentre off the west coast of Sumatra, Indonesia. The earthquake triggered a series of devastating tsunamis along the coasts of most landmasses bordering the Indian Ocean, killing large numbers of people and inundating coastal communities across South and Southeast Asia, including parts of Indonesia, Sri Lanka, India, and Thailand. The disaster has been variously named the Boxing Day Tsunami in Australia, Canada, New Zealand, and the United Kingdom, because it took place on Boxing Day. The tsunami occurred exactly one year after the 2003 earthquake that devastated the southern Iranian city of Bam and exactly two years before the 2006 Hengchun earthquake. The 2004 Indian Ocean earthquake, and series of catastrophic tsunamis that followed in its wake, had a lesson to teach. The world community needs to put in place early detection systems, possibly sponsored by the United Nations, that would undoubtedly save lives. Although this earthquake happened close to large population centers that had little time to act even with warnings, nations farther away would have had time to issue life-saving warnings. Poorer nations are usually in the greatest need of early warning technology but the least able to pay for it. A United Nations sponsored initiative to put in place early warning systems for earthquakes, cyclones, typhoons, tornadoes, and tsunamis would take the world a great distance closer to creating a safe planet for all people, rich and poor. The hypocentre of the main earthquake sits at 3.316° N 95.854° ECoordinates: 3.316° N 95.854° E, approximately 160 km (100 mi) west of Sumatra, at a depth of 30 km (19 mi) below mean sea level (initially reported as 10 km). People felt the earthquake itself (apart from the tsunami) as far away as Bangladesh, India, Malaysia, Myanmar, Thailand, Singapore, and the Maldives. Indonesia lies between the Pacific Ring of Fire along the north-eastern islands adjacent to and including New Guinea and the Alpide belt along the south and west from Sumatra, Java, Bali, Flores, and Timor. 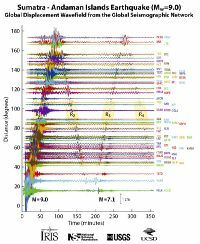 Great earthquakes such as the Sumatra-Andaman event, invariably associated with megathrust events in subduction zones, have seismic moments that can account for a significant fraction of the global earthquake moment across century-scale time periods. The Sumatra-Andaman earthquake measured the largest earthquake since 1964, and the second largest since the Kamchatka earthquake of October 16, 1737. Of all the seismic moment released by earthquakes in the 100 years from 1906 through 2005, roughly one-eighth arose as a result of the Sumatra-Andaman event. That quake, together with the Good Friday Earthquake (Alaska, 1964) and the Great Chilean Earthquake (1960), account for almost half of the total moment. The much smaller but still catastrophic 1906 San Francisco earthquake has been included in the diagram at right for perspective. Mw denotes the magnitude of an earthquake on the moment magnitude scale. Since 1900, the 1960 Great Chilean Earthquake (magnitude 9.5) and the 1964 Good Friday Earthquake in Prince William Sound (9.2) constitute the only earthquakes recorded with a greater magnitude. An earthquake off Kamchatka, Russia, on November 4, 1952, (magnitude 9.0 represents the only other recorded earthquake of magnitude 9.0 or greater). Each of those megathrust earthquakes also spawned tsunamis in the Pacific Ocean, but the death toll from those measured significantly lower. The worst of those caused only a few thousand deaths, primarily because of the lower population density along the coasts near affected areas and the much greater distances to more populated coasts. Other very large megathrust earthquakes occurred in 1868 (Peru, Nazca Plate and South American Plate); 1827 (Colombia, Nazca Plate and South American Plate); 1812 (Venezuela, Caribbean Plate and South American Plate) and 1700 (Cascadia Earthquake, western U.S. and Canada, Juan de Fuca Plate and North American Plate). Geologists calculate that those all had a magnitude 9, but no accurate measurements exist. The earthquake covered an unusually large area in geographical extent. An estimated 1,600 km (994 mi) of faultline slipped about 15 m (50 ft) along the subduction zone where the India Plate slides under the Burma Plate. The slip took place in two phases over a period of several minutes. Seismographic and acoustic data indicate that the first phase involved a rupture about 400 km (250 mi) long and 100 km (60 mi) wide, located 30 km (19 mi) beneath the sea bed—the longest rupture ever known to have been caused by an earthquake. The rupture proceeded at a speed of about 2.8 km/s (1.7 mi/s) or 10,000 km/h (6,300 mph), beginning off the coast of Aceh and proceeding north-westerly over a period of about 100 seconds. A pause of about another 100 seconds took place before the rupture continued northwards towards the Andaman and Nicobar Islands. The northern rupture occurred more slowly than in the south, at about 2.1 km/s (1.3 mi/s) or 7,600 km/h (4,700 mph), continuing north for another five minutes to a plate boundary where the fault changes from subduction to strike-slip (the two plates push past one another in opposite directions). That reduced the speed of the water displacement and so reducing the size of the tsunami that hit the northern part of the Indian Ocean. The India Plate constitutes a part of the great Indo-Australian Plate, which underlies the Indian Ocean and Bay of Bengal, drifting north-east at an average of 6 cm/year (2 inches per year). The India Plate meets the Burma Plate (considered a portion of the great Eurasian Plate) at the Sunda Trench. At that point the India Plate subducts beneath the Burma Plate, which carries the Nicobar Islands, the Andaman Islands and northern Sumatra. The India Plate slips deeper and deeper beneath the Burma Plate until the increasing temperature and pressure drive volatiles out of the subducting plate. Those volatiles rise into the crust above and trigger melt which exits the earth's crust through volcanoes in the form of a volcanic arc. The volcanic activity that results as the Indo-Australian plate subducts the Eurasian plate has created the Sunda Arc. As well as the sideways movement between the plates, estimates put the rise of the sea bed at several metres, displacing an estimated 30 km³ (7 cu mi) of water and triggering devastating tsunami waves. Rather than originating from a point source, as inaccurately depicted in some illustrations of their paths of travel, the waves radiated outwards along the entire 1,600 km (994 mi) length of the rupture (acting as a line source). That greatly increased the geographical area waves covered, reaching as far as Mexico, Chile and the Arctic. The raising of the sea bed significantly reduced the capacity of the Indian Ocean, producing a permanent rise in the global sea level by an estimated 0.1 mm. Reports of numerous aftershocks off the Andaman Islands, the Nicobar Islands and the region of the original epicentre had been received in the hours and days that followed. The largest aftershock, originating off the coast of the Sumatran island of Nias, registered a magnitude of 8.7, prompting debate among seismologists as to whether to classify the event as an aftershock of the December 2004 quake or as a "triggered earthquake" (which typically differs from an aftershock in laying along a different fault line, often as large or larger than the earthquake which triggered it). That earthquake produced its own aftershocks (some registering a magnitude of as great as 6.1) and presently ranks as the seventh largest earthquake on record since 1900. Other aftershocks of up to magnitude 6.6 continued to shake the region daily for up to three or four months. As well as continuing aftershocks, the energy released by the original earthquake continued to make its presence felt well after the event. A week after the earthquake, scientists still measured reverberations, providing valuable scientific data about the Earth's interior. The 2004 Indian Ocean earthquake came just three days after a magnitude 8.1 earthquake in an uninhabited region west of New Zealand's sub-Antarctic Auckland Islands, and north of Australia's Macquarie Island. Geologists note that as unusual, since earthquakes of magnitude 8 or more occur only about once per year on average. Some seismologists have speculated about a connection between those two earthquakes, saying that the former one might have been a catalyst to the Indian Ocean earthquake, as the two earthquakes happened on opposite sides of the Indo-Australian Plate. The U.S. Geological Survey sees no evidence of a causal relationship in this incident. Coincidentally, the earthquake struck almost exactly one year (to the hour) after a 6.6 magnitude earthquake killed an estimated 30,000 people in the city of Bam in Iran on December 26, 2003. Early estimated placed the total energy released by the 2004 Indian Ocean earthquake as high as 3.35 exajoules (3.35×1018 joules). That equals over 930 terawatt hours, 0.8 gigatons of TNT, or about as much energy used in the United States in 11 days. A new seismic energy release estimate, generated on September 30, 2005, using new data, placed the amount of energy released by the earthquake at the somewhat smaller figure of 1.1×1018 joules, equivalent to about 250 megatons of TNT. The earthquake generated seismic oscillation of the Earth's surface of up to 20–30 cm (8–12 in), equivalent to the effect of the tidal forces caused by the Sun and Moon. People felt the shock waves of the earthquake across the planet; as far away as the U.S. state of Oklahoma, where scientists recorded vertical movements of 3 mm (0.12 in). Because of its enormous energy release and shallow rupture depth, the earthquake generated remarkable seismic ground motions around the globe, particularly due to huge Rayleigh (surface) elastic waves that exceeded 1 cm in vertical amplitude everywhere on Earth. The record section plot below displays vertical displacements of the Earth's surface recorded by seismometers from the IRIS/USGS Global Seismographic Network plotted with respect to time (since the earthquake initiation) on the horizontal axis, and vertical displacements of the Earth on the vertical axis (note the 1 cm scale bar at the bottom for scale). The seismograms have been arranged vertically by distance from the epicenter in degrees. The earliest, lower amplitude, signal represents the compressional (P) wave, which takes about 22 minutes to reach the other side of the planet (the antipode; in this case near Ecuador). The largest amplitude signals represent seismic surface waves that reach the antipode after about 100 minutes. The surface waves can be clearly seen to reinforce near the antipode (with the closest seismic stations in Ecuador), and to subsequently encircle the planet to return to the epicentral region after about 200 minutes. A major aftershock (magnitude 7.1) can be seen at the closest stations starting just after the 200 minute mark. That aftershock would be considered a major earthquake under ordinary circumstances, but the mainshock dwarfed it. In February 2005, the British Royal Navy vessel HMS Scott surveyed the seabed around the earthquake zone, which varies in depth between 1,000 m and 5,000 m (3,300 ft and 16,500 ft). The survey, conducted using a high-resolution, multi-beam sonar system, revealed that the earthquake had made a huge impact on the topography of the seabed. 1,500-meter (5,000 ft) high thrust ridges created by previous geologic activity along the fault had collapsed, generating landslides several kilometers wide. One such landslide consisted of a single block of rock some 100 m high and 2 km long (300 ft by 1.25 mi). The momentum of the water displaced by tectonic uplift had also dragged massive slabs of rock, each weighing millions of tons, as far as 10 km (7 mi) across the seabed. An oceanic trench several kilometers wide appeared in the earthquake zone. The TOPEX/Poseidon and Jason 1 satellites happened to pass over the tsunami as it crossed the ocean. Those satellites carry radars that measure precisely the height of the water surface; anomalies of the order of 50 cm (20 in) had been measured. Measurements from those satellites may prove invaluable for the understanding of the earthquake and tsunami. Unlike data from tide gauges installed on shores, measurements obtained in the middle of the ocean can be used for computing the parameters of the source earthquake without having to compensate for the complex ways in which close proximity to the coast changes the size and shape of a wave. Animation of the tsunami caused by the earthquake showing how the tsunami radiated from the entire length of the 1,600 kilometre (994 mi) rupture. The sudden vertical rise of the seabed by several metres during the earthquake displaced massive volumes of water, resulting in a tsunami that struck the coasts of the Indian Ocean. Scientists sometimes call a tsunami which causes damage far away from its source a "teletsunami,," usually produced by vertical motion of the seabed rather than by horizontal motion. The tsunami, like all others, behaves very differently in deep water than in shallow water. In deep ocean water, tsunami waves form only a small hump, barely noticeable and harmless, which generally travels at a very high speed of 500 to 1,000 km/h (310 to 620 mph); in shallow water near coastlines, a tsunami slows down to only tens of kilometres an hour but in doing so forms large destructive waves. Scientists investigating the damage in Aceh found evidence that the wave reached a height of 24 m (80 ft) when coming ashore along large stretches of the coastline, rising to 30 m (100 ft) in some areas when travelling inland. Radar satellites recorded the heights of tsunami waves in deep water: at two hours after the earthquake, the maximum height reached 60 cm (2 ft). Those represent the first such observations ever made although they lacked the capacity to provide a warning since the satellite data took hours to analyze. According to Tad Murty, vice-president of the Tsunami Society, the total energy of the tsunami waves equaled about five megatons of TNT (20 petajoules). That amounts to more than twice the total explosive energy used during all of World War II (including the two atomic bombs), but still a couple of orders of magnitude less than the energy released in the earthquake itself. In many places the waves reached as far as 2 km (1.24 mi) inland. The 1,600 km (994 mi) of faultline affected by the earthquake lay in a nearly north-south orientation, the greatest strength of the tsunami waves moved in an east-west direction. Bangladesh, which lies at the northern end of the Bay of Bengal, had very few casualties despite being a low-lying country relatively near the epicentre, benefiting from the earthquake proceeded more slowly in the northern rupture zone. That greatly reducing the energy of the water displacements in the region. Coasts that have a landmass between them and the tsunami's location of origin usually escaped damage, although on occasion tsunami waves sometimes diffract around such landmasses. Thus, the tsunami hit the Indian state of Kerala despite sitting on the western coast of India, and the western coast of Sri Lanka also suffered substantial impacts. Also distance alone lacks a guarantee of safety; Somalia got hit harder than Bangladesh despite being much farther away. Because of the distances involved, the tsunami took anywhere from fifteen minutes to seven hours (for Somalia) to reach the various coastlines. The northern regions of the Indonesian island of Sumatra received waves very quickly, while Sri Lanka and the east coast of India suffered hits roughly 90 minutes to two hours later. Waves also Thailand struck about two hours later despite being closer to the epicentre, because the tsunami travelled more slowly in the shallow Andaman Sea off its western coast. Observers noticed the tsunami as far as Struisbaai in South Africa, some 8,500 km (5,300 mi) away, where a 1.5 m (5 ft) high tide surged on shore about 16 hours after the earthquake. It took a relatively long time to reach that spot at the southernmost point of Africa, probably because of the broad continental shelf off South Africa and because the tsunami would have followed the South African coast from east to west. The tsunami also reached Antarctica, where tidal gauges at Japan's Showa Base recorded oscillations of up to a meter, with disturbances lasting a couple of days. Some of the tsunami's energy escaped into the Pacific Ocean, where it produced small but measurable tsunamis along the western coasts of North and South America, typically around 20 to 40 cm (7.9 to 15.7 in). At Manzanillo, Mexico, a tsunami measured 2.6 m (8.5 ft) crest-to-trough, large enough for detection in Vancouver, British Columbia, Canada. That puzzled many scientists, as the tsunamis in some parts of South America measured larger than those in some parts of the Indian Ocean. Some scientists theorized that the tsunamis focused, directed at long ranges by the mid-ocean ridges running along the margins of the continental plates. Despite a lag of up to several hours between the earthquake and the impact of the tsunami, the killer waves took nearly all of the victims completely by surprise. No tsunami warning systems in the Indian Ocean exist to detect tsunamis or to warn the general populace living around the ocean. Tsunami physics complicate detection; while a tsunami runs in deep water it has little height. Secondly, detection requires a network of sensors to detect it. Setting up the communications infrastructure to issue timely warnings constitutes an even bigger problem, particularly in a relatively poor part of the world. Tsunamis occur much more frequently in the Pacific Ocean because of earthquakes in the "Ring of Fire," and an effective tsunami warning system has long been in place there. Although the extreme western edge of the Ring of Fire extends into the Indian Ocean (the point where this earthquake struck), no warning system exists in that ocean. Tsunamis have been relatively rare despite earthquakes frequently hitting Indonesia. The Krakatoa eruption of 1883 caused the last major tsunami. Large earthquakes only occasionally produce large tsunamis; on March 28, 2005, a magnitude 8.7 earthquake hit roughly the same area of the Indian Ocean without resulting in a major tsunami. In the aftermath of the disaster, awareness has increased for the need of a tsunami warning system for the Indian Ocean. The United Nations started working on an Indian Ocean Tsunami Warning System and by 2005 had the initial steps in place. Some have even proposed creating a unified global tsunami warning system, to include the Atlantic Ocean and Caribbean. 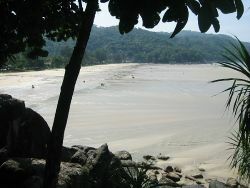 Maximum recession of tsunami waters at Kata Noi Beach, Thailand, before the third, and strongest, tsunami wave (sea visible in the right corner, the beach is at the extreme left), 10:25 A.M. local time. The earthquake itself serves as the first warning sign of a possible tsunami, although a tsunami can strike thousands of kilometres away from the epicenter of the earthquake with slight or negligible movement felt. In the minutes preceding a tsunami strike, the sea often recedes temporarily from the coast, proving another warning sign. Around the Indian Ocean, that rare sight reportedly induced people, especially children, to visit the coast to investigate and collect stranded fish on as much as 2.5 km (1.6 mi) of exposed beach, with fatal results. People on the Indonesian island of Simeulue, very close to the epicentre, number among the few coastal areas to evacuate ahead of the tsunami. Island folklore recounted an earthquake and tsunami in 1907, and the islanders fled to inland hills after the initial shaking yet before the tsunami struck. On Maikhao beach in northern Phuket, Thailand, a ten-year-old British tourist named Tilly Smith who had studied tsunami in geography class at school, recognized the warning signs of the receding ocean and frothing bubbles. She and her parents warned others on the beach, leading to everyone evacuating safely. John Chroston, a biology teacher from Scotland, also recognized the signs at Kamala Bay north of Phuket, taking a busload of vacationers and locals to safety on higher ground. The tsunami constituted a succession of several waves, occurring in retreat and rise cycles with a period of over thirty minutes between each peak. The third wave proved the most powerful and reached highest, occurring about an hour and a half after the first wave. Smaller tsunamis continued to occur for the rest of the day. Receding waters after the second tsunami, 10:20 A.M.
3rd tsunami wave, 11:00 A.M.
4th tsunami wave, 11:22 A.M. The U.S. Geological Survey initially recorded the toll as 283,100 killed, 14,100 missing, and 1,126,900 people displaced. Early news reports after the earthquake spoke of a toll in the hundreds, but the numbers rose steadily over the following week. More recent figures indicate that the actual casualties numbered 186,983 dead and 42,883 missing, for a total of 229,866, as more and more displaced survivors have been found and name duplications eliminated from the lists of victims. Measured in lives lost, the disaster makes the list of the top ten worst earthquakes in recorded history, as well as the single worst tsunami in history. Relief agencies report that children appeared to total one-third of the dead, a result of the high proportion of children in the populations of many of the affected regions. Also children had the least ablity to resist being overcome by the surging waters. Oxfam went on to report that as many as four times more women than men died in some regions because they waited on the beach for the fishermen to return and they looked after their children in the houses. In addition to the large number of local residents, up to 9,000 foreign tourists (mostly Europeans) enjoying the peak holiday travel season numbered among the dead or missing, especially people from the Nordic countries. The European nation hardest hit may have been Sweden, whose death toll hit 428 dead, with 116 missing. Sri Lanka, Indonesia, and the Maldives declared states of emergency. The United Nations estimated at the outset that the relief operation (presently still underway) would become the costliest in human history. UN Secretary-General Kofi Annan has stated that reconstruction would probably take between five and ten years. Governments and non-governmental organizations fear the final death toll may double as a result of diseases, prompting a massive humanitarian response. For purposes of establishing timelines of local events, the affected areas time zones follow: UTC+3: (Kenya, Madagascar, Somalia, Tanzania); UTC+4: (Mauritius, Réunion, Seychelles); UTC+5: (Maldives); UTC+5:30: (India); UTC+6: (Bangladesh, Sri Lanka); UTC+6:30: (Cocos Islands, Myanmar); UTC+7: (Indonesia (western), Thailand); UTC+8: (Malaysia, Singapore). Since the earthquake occurred at 00:58:53 UTC, add the above offsets to find the local time of the earthquake. Note: All figures are approximate and subject to change. The first column links to more details on specific countries. Countries most affected by the 2004 Indian Ocean earthquake. 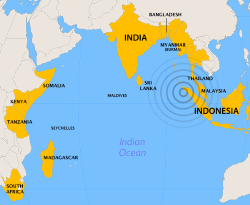 The earthquake and resulting tsunami affected many countries in Southeast Asia and beyond, including Indonesia, Sri Lanka, India, Thailand, the Maldives, Somalia, Myanmar, Malaysia, Seychelles and others. Many other countries, especially Australia and those in Europe, had large numbers of citizens traveling in the region on holiday. Both Sweden and Germany lost over 500 citizens each in the disaster. This earthquake measured the fourth most powerful earthquake recorded since 1900, and the confirmed death toll numbers just under 200,000 due to the ensuing tsunami. The deadliest earthquakes since 1900 include the Tangshan, China earthquake of 1976, with at least 255,000 killed; the earthquake of 1927 in Xining, Qinghai, China (200,000); the Great Kanto earthquake which struck Tokyo in 1923 (143,000); and the Gansu, China, earthquake of 1920 (200,000). The deadliest known earthquake in history occurred in 1556 in Shaanxi, China, with an estimated death toll of 830,000, although scientists question the reliability of figures from that time period. The 2004 tsunami has been deemed the deadliest in recorded history. Prior to 2004, in 1782 the deadliest recorded tsunami in the Pacific Ocean with 40,000 people killed by a tsunami in the South China Sea. The tsunami created by the 1883 eruption of Krakatoa resulted in an estimated 36,000 deaths. The most deadly tsunami between 1900 and 2004 occurred in 1908 in Messina, Italy, on the Mediterranean Sea, where the earthquake and tsunami killed 70,000. The most deadly tsunami in the Atlantic Ocean resulted from the 1755 Lisbon earthquake, which, combined with the toll from the actual earthquake and resulting fires, killed over 100,000. The 2004 earthquake and tsunami combined have been described as the deadliest natural disaster since either the 1976 Tangshan earthquake or the 1970 Bhola cyclone, or could conceivably exceed both of those. Because of uncertainty over death tolls, doubt may always exist over which of those natural disasters measured the deadliest. A village near the coast of Sumatra lies in ruin on January 2, 2005. a United States military helicopter crew from the USS Abraham Lincoln, conducting humanitarian operations, took this picture. Indonesians gather under an approaching helicopter to receive food and supplies. The human destruction of coral reefs played a significant role in the destruction caused by the tsunami. Many countries across Asia, including Indonesia, Sri Lanka and Bangladesh, have put forth efforts to destroy the coral surrounding their beaches, and instead make way for shrimp farms and other economic choices. On the Surin Island chain of Thailand's coast, many people survived as the tsunami rushed against the coral reefs protecting the islands. Many fewer people on lived on those islands, which also helps explain the lower death toll. Many reefs areas around the Indian Ocean have been exploded with dynamite because they impede shipping, an important part of the South Asian economy. Similarly, the removal of coastal mangrove trees may have intensified the effect of the tsunami in some locations. Those trees, which had lined the coast before builders removed them to make way for coastal residences, might have blocked the force of the tsunami. The removal of coastal sand dunes constitutes another factor. Populations needed enormous humanitarian aid because of widespread damage of the infrastructure, shortages of food and water, and economic damage. Epidemics posed a special concern due to the high population density and tropical climate of the affected areas. Humanitarian and government agencies concentrated on providing sanitation facilities and fresh drinking water to contain the spread of diseases such as cholera, diphtheria, dysentery, typhoid and hepatitis A and B. Governments and humanitarian organizations, concerned that the death toll could rise further as diseases and hunger spread, took quick action, minimizing the loss. In the days following the tsunami, people worked quickly to bury bodies for fear of disease. In retrospect the public health risks may have been exaggerated, leading to the speculation that resources may have been better allocated. The World Food Programme provided food aid to more than 1.3 million people affected by the tsunami. Nations all over the world provided over US$7 billion in aid for damaged regions, with the governments of Australia pledging US$819.9 million (including a US$760.6-million aid package for Indonesia), Germany offering US$660 million, Japan offering US$500 million, Canada offering US$343 million, Norway and The Netherlands offering both US$183 million, the United States offering US$35 million initially (increased to US$350 million), and the World Bank offering US$250 million. Also Italy offered US$ 95 million, increased later to US$ 113 million of which US$ 42 million where donated by the population using the SMS system According to USAID, the US has pledged additional funds in long-term U.S. support to help the tsunami victims rebuild their lives. On February 9, 2005, President Bush asked the U.S. Congress to increase the U.S. commitment to a total of $950 million. Officials estimated that billions of dollars would be needed. Bush also asked his father, former President George H. W. Bush, and former President Bill Clinton to lead a U.S. effort to provide private aid to the tsunami victims. In mid-March the Asian Development Bank reported that over US$4 billion in aid promised by governments behind schedule. Sri Lanka reported that it had yet to receive foreign government aid, while foreign individuals had been generous. The public donationed generously to many charities. For example, in the UK the public donated roughly £330,000,000 sterling (nearly US$600,000,000). That considerably outweighed the donation by the government and came to an average of about £5.50 (US$10) donated by every citizen. In August 2006, the bodies of 15 local aid staff working on post-tsunami rebuilding executed in northeast Sri Lanka after heavy fighting had been found, the main umbrella body for aid agencies in the country said. Reports and rumors circulated that the local aid workers had been killed. The impact on coastal fishing communities and fisherfolk, some of the poorest people in the region, has been devastating with high losses of income earners as well as boats and fishing gear. In Sri Lanka artisanal fishery, fisherman commonly use fish baskets, fishing traps, and spears, an important source of fish for local markets; industrial fishery constitutes the major economic activity, providing direct employment to about 250,000 people. In recent years the fishery industry has emerged as a dynamic export-oriented sector, generating substantial foreign exchange earnings. Preliminary estimates indicate that 66% of the fishing fleet and industrial infrastructure in coastal regions have been destroyed by the wave surges, which will have adverse economic effects both at local and national levels. But some economists believe that danger to the affected national economies minor since losses in the tourism and fishing industries represent a relatively small percentage of the GDP. Others caution that damage to infrastructure may prove an overriding factor. In some areas drinking water supplies and farm fields may have been contaminated for years by salt water from the ocean. Both the earthquake and the tsunami may have affected shipping in the Malacca Straits by changing the depth of the seabed and by disturbing navigational buoys and old shipwrecks. Compiling new navigational charts may take months or years. Countries in the region appealed to tourists to return, pointing out that most tourist infrastructure remained undamaged. Tourists have been slow to return out of reluctance of spending vacation time in the scene of recent unimaginable destruction and loss of life. Even resorts on the Pacific coast of Thailand, completely untouched, experienced heavy cancellations. One year after the tsunami hit, tourism had begun to climb again. Beyond the heavy toll on human lives, the Indian Ocean earthquake has caused an enormous environmental impact that will affect the region for many years to come. Reports of severe damage inflicted on ecosystems such as mangroves, coral reefs, forests, coastal wetlands, vegetation, sand dunes and rock formations, animal and plant biodiversity and groundwater have been received by governments and media. In addition, the spread of solid and liquid waste and industrial chemicals, water pollution and the destruction of sewage collectors and treatment plants threaten the environment even further, in untold ways. The environmental impact will take a long time and significant resources to assess. According to specialists, poisoning of the freshwater supplies and the soil by saltwater infiltration and deposit of a salt layer over arable land has been the most serious damage. In the Maldives, 16 to 17 coral reef atolls, overcome by sea waves, standing totally without fresh water, could be rendered uninhabitable for decades. Sea, sand and earth invaded countless wells that served communities, invading aquifers through porous rock. Salted-over soil becomes sterile, rendering restoration for agriculture difficult and costly, causes the death of plants and important soil micro-organisms as well. The event destroyed thousands of rice, mango and banana plantations in Sri Lanka almost entirely, expected to take years to recover. The United Nations Environment Programme (UNEP) has been working with governments of the region to determine the severity of the ecological impact and how to address it. UNEP has decided to earmark a US$1,000,000 emergency fund and to establish a Task Force to respond to requests for technical assistance from countries affected by the tsunami. In response to a request from the Maldivian Government, the Australian Government sent ecological experts to help restore marine environments and coral reefs—the lifeblood of Maldivian tourism. Much of the ecological expertise has been rendered from work with the Great Barrier Reef, in Australia's north-eastern waters. Many health professionals and aid workers have reported widespread psychological trauma associated with the tsunami. Traditional beliefs in many of the affected regions state that a relative of the family must bury the body of the dead, and in many cases, no body remained to be buried. The hardest hit area, Aceh, a religiously conservative Islamic society, has had no tourism nor any Western presence in recent years due to armed conflict between the Indonesian military and Acehnese separatists. Some believe that the tsunami represented divine punishment for lay Muslims shirking their daily prayers and/or following a materialistic lifestyle. Others have said that Allah felt angry that Muslims killed other Muslims in an ongoing conflict. Women in Aceh required a special approach from foreign aid agencies, and continue to have unique needs. In what may be the most significant positive result of the tsunami, the widespread devastation led the main rebel group GAM to declare a cease-fire on December 28, 2004, followed by the Indonesian government, and the two groups resumed long-stalled peace talks, which resulted in a peace agreement signed August 15, 2005. The agreement explicitly cites the tsunami as a justification. In another positive note of the tsunami, the water washed away centuries of sand from some of the ruins of a 1,200-year-old lost city at Mahabalipuram on the south coast of India. The site, containing such notable structures as a half-buried granite lion near a seventh century Mahablipuram temple and a relic depicting an elephant, belongs to what archaeologists deem an ancient port city swallowed by the sea hundreds of years ago. ↑ T. Lay, H. Kanamori, et al., "The Great Sumatra-Andaman Earthquake of December 26, 2004," Science 308 (2005):(1127–1133). Retrieved April 27, 2018. ↑ Maggie McKee, "Power of tsunami earthquake heavily underestimated" New Scientist, February 9, 2005. Retrieved April 27, 2018. ↑ "Reconnaissance report of the 2004 Great Sumatra-Andaman, Indonesia, Earthquake" Journal of Natural Disaster Science 28(1) (2006):35-41. Retrieved April 27, 2018. ↑ Ken Kostel and Mary Tobin, The Sound of a Distant Rumble: Researchers Track Underwater Noise Generated by December 26 Earthquake. Lamont-Doherty Earth Observatory, The Earth Institute at Columbia University, July 20, 2005. Retrieved April 27, 2018. ↑ Roger Bilham, A Flying Start, Then a Slow Slip. Science 308(5725) (May 20, 2005): 1126–1127. Retrieved April 27, 2018. ↑ Chris Rowan, Aftershocks, triggered earthquakes, and Christchurch’s seismic future. Highly Allochthonous, February 26, 2011. Retrieved September 6, 2018. ↑ Sumatra shaken by new earthquake. BBC News, April 10, 2005. Retrieved September 6, 2018. ↑ USGS Earthquake Statistics. US Geological Survey. Retrieved September 6, 2018. ↑ Will Knight, Asian tsunami seabed pictured with sonar. New Scientist, February 10, 2005. Retrieved September 6, 2018. ↑ TOPEX/Poseidon Satellite Data on the December 26, 2004 tsunami in the Indian Ocean. Aviso Retrieved September 6, 2018. ↑ Emilio Lorca and Margot Recabarren. . (PDF) Earthquakes and Tsunamis. High School Textbook. 1997. noaa.gov. Retrieved October 19, 2009. ↑ John Leslie, NOAA Scientists able to Measure Tsunami Height from Space. NOAA Magazine, January 10, 2005. Retrieved July 31, 2013. ↑ Maggie McKee, Radar satellites capture tsunami wave height. New Scientist, January 6, 2005. Retrieved July 31, 2013. ↑ Time travel map: Tsunami Laboratory, Novosibirsk, Russia. Retrieved July 31, 2013. ↑ Time travel map: Active Fault Research Center: National Institute of Advanced Industrial Science and Technology, Japan. Retrieved October 19, 2009. ↑ "Indian Ocean Tsunami" at Syowa Station, Antarctica, Hydrographic and Oceanographic Dept. Japan Coast Guard. Retrieved July 31, 2013. ↑ Melissa Block, Sri Lankans Seek Lost Relatives After Tsunami. All Things Considered/NPR. December 27, 2004. Retrieved July 31, 2013. ↑ Girl, 10, used geography lesson to save lives. News.Telegraph, January 1, 2005. ↑ Staff Writer. "Most tsunami dead female - Oxfam." BBC News March 26, 2005. Retrieved July 31, 2013. ↑ Staff Writer. "Sweden's tsunami death toll reaches 428." The Local: Sweden's News in English. May 19, 2005. Retrieved July 31, 2013. ↑ Meisl, C.S. and Safaie S., Elwood K.J., Gupta R. & Kowsari R. (2006). Housing Reconstruction in Northern Sumatra after the December 2004 Great Sumatra Earthquake and Tsunami. Earthquake Spectra 22: S777. ↑ 22.0 22.1 22.2 One year after the tsunami, Sri Lankan survivors still live in squalour. World Socialist Web Site (2005-12-29). Retrieved July 31, 2013. ↑ 23.0 23.1 TsunamiMemorial.or.th. Web.archive.org (2007-09-28). Archived from the original on 2007-09-28. Retrieved July 31, 2013. ↑ Schwartz, D. and Goldberg A., Ashenasi I., Nakash G., Leiba A., Levei Y. & Bar-Dayan Y. (2006). Prehospital care of tsunami victims in Thailand: description and analysis. Prehospital Disaster Medicine 21 (3): 204–210. ↑ Martin Plaut. "Tsunami: Somalia's slow recovery", BBC News, 2005-12-26. Retrieved July 31, 2013. ↑ India, Indonesia, Maldives, Myanmar, Somalia, Thailand: Earthquake and Tsunami OCHA Situation Report No. 14. Reliefweb.int. Retrieved July 31, 2013. ↑ Myanmar is withholding true casualties figures, says Thai priest. web.archive.org (4 January 2005). Archived from the original on 9 October 2006. Retrieved July 31, 2013. ↑ "Asia-Pacific | 'Hundreds feared dead' in Burma", BBC News, 2005-01-04. Retrieved July 31, 2013. ↑ TsunamiMaldives.mv. Web.archive.org (2009-06-17). Archived from the original on 2009-06-17. Retrieved July 31, 2013. ↑ UNICEF (May 2006). The 2004 Indian Ocean Tsunami Disaster: Evaluation of UNICEF's response (emergency and recovery phase). Maldives Report. Retrieved July 31, 2013. ↑ english@peopledaily.com.cn (13 January 2005). Death toll in Asian tsunami disaster tops 159,000. People's Daily. Retrieved July 31, 2013. ↑ Killer Waves. Channelnewsasia.com. Retrieved December 24, 2012. 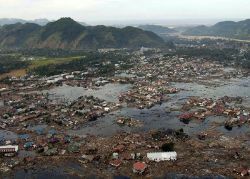 ↑ Asian tsunami death toll passes 144,000. ABC (3 January 2005). Archived from the original on 17 June 2009. Retrieved August 12, 2010. ↑ 34.0 34.1 The Seychelles raises its voice. Web.archive.org. Retrieved August 12, 2010. ↑ Tsunami Evaluation Coalition: Initial Findings (PDF). Archived from the original on 24 March 2006. Retrieved August 12, 2010. ↑ Okal, E.A. and Hartnady C.J. (2010). The South Sandwich Islands earthquake of 27 June 1929: seismological study and inference on tsunami risk for the southern Atlantic. South African Journal of Geology 112 (3–4): 359–370. ↑ IRIN Middle East | YEMEN: Tsunami damage over US $1 million - UNEP assessment. Irinnews.org. Retrieved December 24, 2012. ↑ "Tsunami devastates Somali island", BBC News, 2004-12-29. Retrieved December 24, 2012. ↑ Most Destructive Known Earthquakes on Record in the World (Earthquakes with 50,000 or More Deaths). United States Geological Survey. Retrieved July 31, 2013. ↑ 41.0 41.1 Andrew Browne, "Tsunami's Aftermath: On Asia's Coasts, Progress Destroys Natural Defenses." Wall Street Journal A5, December 31, 2004. ↑ UN upbeat on tsunami hunger aid. BBC News January 9, 2005. Retrieved July 31, 2013. ↑ Tsunami aid: Who's giving what. Breakdown of $7 billion. BBC News, January 27, 2005. Retrieved July 31, 2013. ↑ Clinton, Bush: Tsunami Aid Helping." The Early Show/CBS News February 21, 2005. Retrieved July 31, 2013. ↑ Tsunami aid shortfall over $4bn. BBC News, March 18, 2005. Retrieved July 31, 2013. ↑ Indian Ocean Tsunamis Devastate Fisherfolk." UK Agricultural Biodiversity Coalition. December 26, 2004. Retrieved July 31, 2013. ↑ "Food Supply and Food Security Situation in Countries Affected by the Asia Tsunami." Food and Agriculture Organization of the United Nations. January 14, 2005. ↑ Fred Pearce, Tsunami's salt water may leave islands uninhabitable. New Scientist January 5, 2005. Retrieved July 31, 2013. ↑ "Tsunami redrew ship channels, ocean floor." MSNBC/Associated Press, January 5, 2005. Retrieved July 31, 2013. ↑ Tsunami tourism on track, but not quite fully recovered. USA Today/Associated Press December 19, 2005. Retrieved July 31, 2013. ↑ Impact of Tsunamis on Ecosystems. UN Atlas of the Oceans. March 10, 2005. Retrieved July 31, 2013. ↑ Eric Falt, Environmental Issues Emerging from Wreckage of Asian Tsunami. United Nations Environment Programme. Retrieved July 31, 2013. ↑ Road Map for Sri Lanka’s Sustainable Reconstruction. United Nations Environment Programme; Environment for Development. Retrieved July 31, 2013. ↑ Bill Broadway, Divining a Reason for Devastation. Washington Post, January 8, 2005. Retrieved July 31, 2013. ↑ Memorandum of Understanding between Indonesian government and the Free Aceh Movement. (PDF), BBC News. August 15, 2005. Retrieved July 31, 2013. ↑ India finds more 'tsunami gifts'. BBC News February 27, 2005. Retrieved July 31, 2013. Earthquake Engineering Research Institute, and W. D. Iwan. 2006. Summary report on the great Sumatra earthquakes and Indian Ocean tsunamis of 26 December 2004 and 28 March 2005. Oakland, CA: Earthquake Engineering Research Institute. ISBN 9781932884197. BBC News - In-Depth Report: Tsunami Disaster. Tsunami tragedy: Report Index in The Hindu including the post Tsunami relief work. CNN - Tsunami, One Year After. Guardian Unlimited - Special Report: Indian Ocean Tsunami Disaster. Sydney Morning Herald - Waves of Devastation. The Local - the Indian Ocean tsunami and its effect on Sweden. 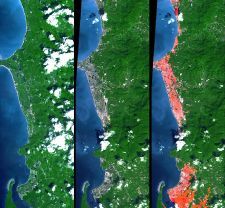 Satellite images of tsunami-affected areas (National University of Singapore). 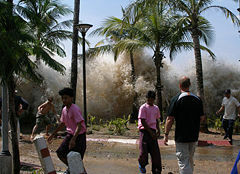 Tsunamis.com - 2004 Asian Tsunami Pictures. "After the Tsunami" Danish writer and photographer Thorsten Overgaard's documentary on the relief work after the December 26, 2004 tsunami.. The December 26, 2004, Sumatra Earthquake and Indian Ocean Tsunami: Field Perspectives on the Impacts to the Peoples, Cultures, Politics, and Economies of One of the World's Most Vibrant Regions, Speaker: Tom Casadevall, September 26, 2006..
A Comprehensive Inquiry Based Classroom Exercise for High School Students using the actual seismograms. Sumatra-Andaman Islands Earthquake - IRIS Special Report. Envirtech Tsunami Warning System, based on real time seafloor observatories measuring seismic waves and sea levels. History of "2004 Indian Ocean earthquake"
This page was last modified on 18 January 2019, at 20:40.